Provide comfort for the family of Sam Coates with a meaningful gesture of sympathy. Sam Edward Coates, age 91, of Warsaw, passed away on Tuesday, March 26, 2019. He was a retired Construction Superintendent for Kent Brothers Construction Company. He is survived by his daughter, Betty Lou Taylor (William); grandchildren, Sandy Jo Dungan and William E. Taylor, Jr; great-grandchildren, Devin Marks Dungan, Madison Lee Dungan, Alexi Dale Taylor, Karli Mariah Taylor, Jennie Lynn Packett and Dylan Taylor Dungan; brothers, Harrison Coates and Tommy Coates; sisters, Annie Gray Douglas, Alice Swann, Thelma Lee O’Bier, Lucy Thurston and Violet Mozingo. Sam was preceded in death by his wife, Annie Mae Marks Coates; his parents, Thomas and Annie Lee Coates; and his grandson, Dusty Dale Dungan. A Funeral service will be held at 11:00 am on Monday, April 1, 2019 at Welch Funeral Home, Marks Chapel with Rev. Kenny Park and Pastor Allen Hopkins officiating. Interment will follow the service at Jerusalem Baptist Church Cemetery. The family will receive friends one hour prior to the funeral service at Welch Funeral Home, Marks Chapel. To send flowers in memory of Sam Edward Coates, please visit our Heartfelt Sympathies Store. Robert Kent sent flowers to the family of Sam Edward Coates. With Sympathy, J.L. 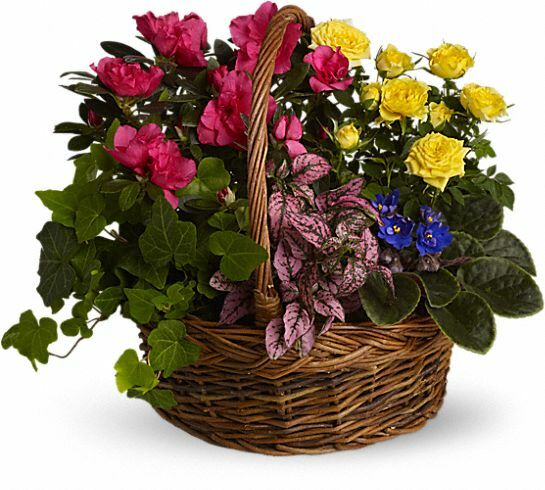 Kent and Sons, Inc.
Robert Kent purchased the Blooming Garden Basket for the family of Sam Coates. May the family of Sam Edward Coates please accept my sincere condolences hoping you find comfort in God's words at Acts 24:15 and Psalm 37:29.